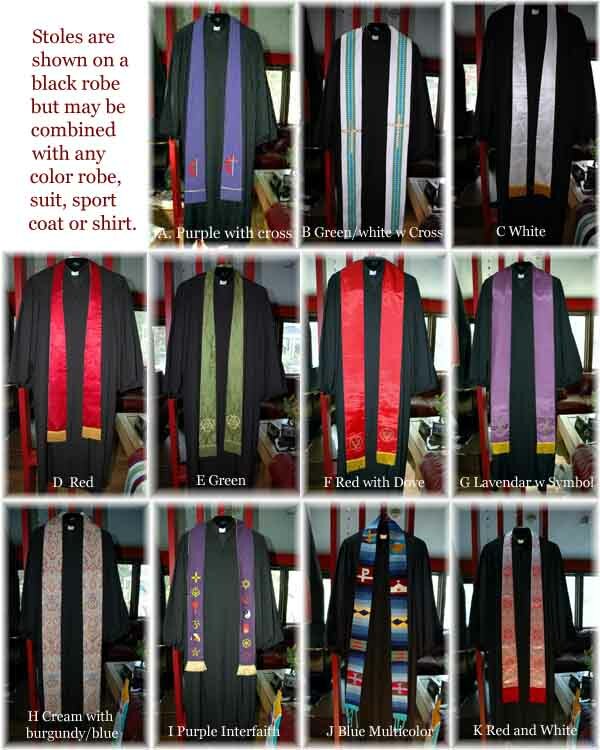 With the Beautiful Basics and Remembrance Custom Weddings we provide little extras in clothing including matching clothing, robes, stoles and table dressings complementary to the color scheme of your wedding. None of the information on this page applies to WedXpress mini weddings. 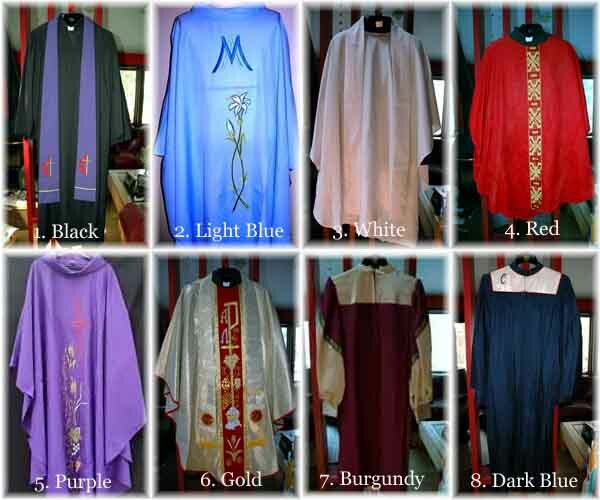 Beautiful Basics clients and Remembrance Custom Wedding clients allow the couple to choose the officiant clothing. We can dress appropriately for your ceremony, formal or informal. 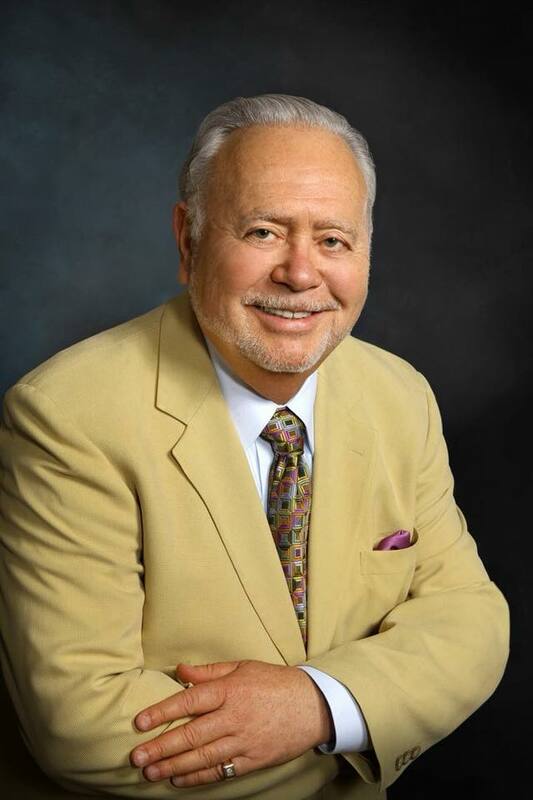 Photos of tuxedos, suits, sport coat, robes with stoles and casual wear are shown throughout the site. There is a Tuxedo Rental charge If you'd like us to wear a tuxedo. Or we can dress to match any theme. If we have clothing to match your theme there is not additional charge. If we need to purchase items we will contact you with the cost, prior to purchase. For informal non-religious weddings couples may choose Casual pants and shirts, jeans or shorts and a shirt; or, if more formal they can choose sport coat, pants, shirt and tie. We don't just show up and read. Part of our services we include at no charge is providing the right decorum to meet your needs and desires. This attention to detail is one of the many things that wedding planners tell us that separates us from our competitors. In an Beautiful Basics simple ceremony we bring a Pulpit/podium with velvet covering to coordinate with your wedding colors; you can choose the color velvet shown below. 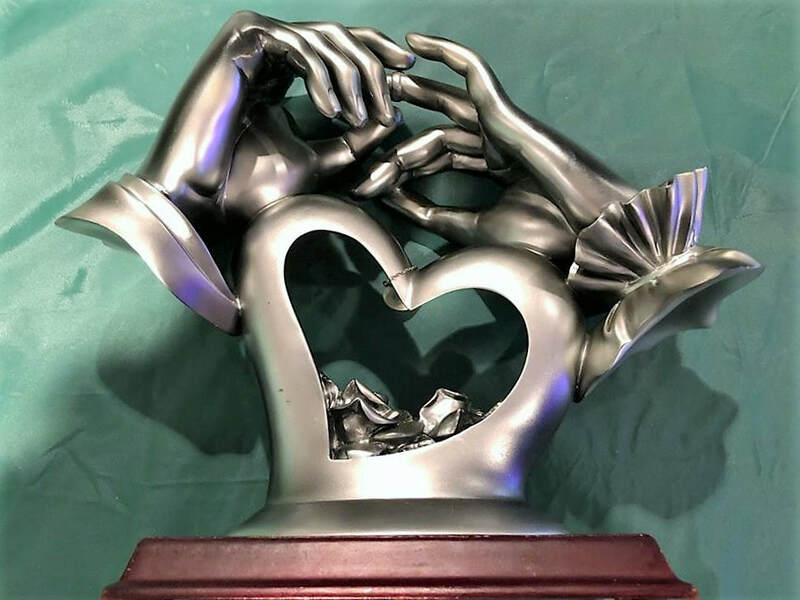 ​For full service Remembrance Custom Weddings we come prepared with an alter, pulpit, cross, candles and more. For non-religious services we will be prepared with a podium and tables. If you are looking for a religious service we come prepared with an altar, pulpit, cross, candles and more. For non religious services we will be prepared with a podium and tables. 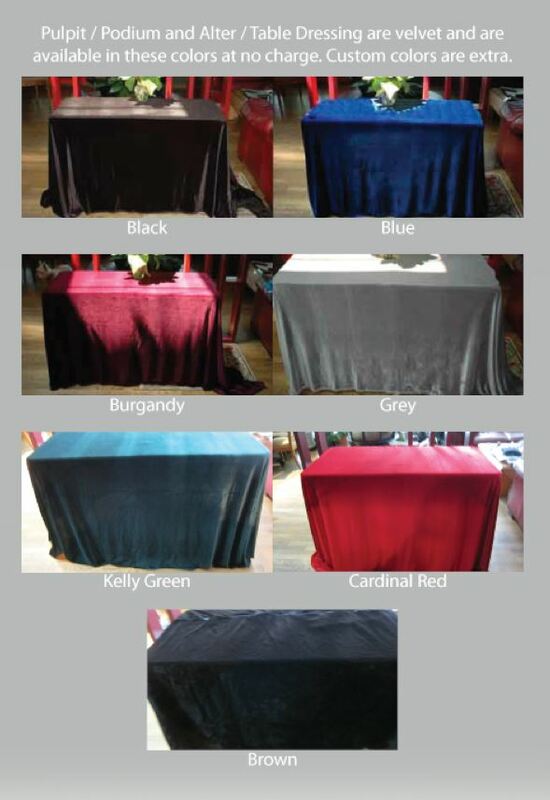 We offer pulpit/podium and altar/table velvet dressings in burgundy, black, gray, Kelly green, chocolate brown, cardinal red and royal blue. See photos below for examples of our seven standard colors. White Cotton is also available. Because the white table dressings often look soiled after one use there is an additional fee of $75.00 for white cotton table and lectern dressings. Additionally clients may provide custom table and lectern dressings of their own design and manufacture at no additional charge. 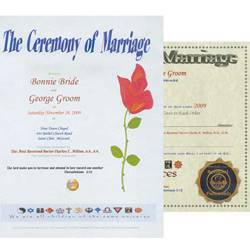 All Remembrance Custom Weddings come with a four color bound copy of your ceremony text and a Certificate of Marriage.